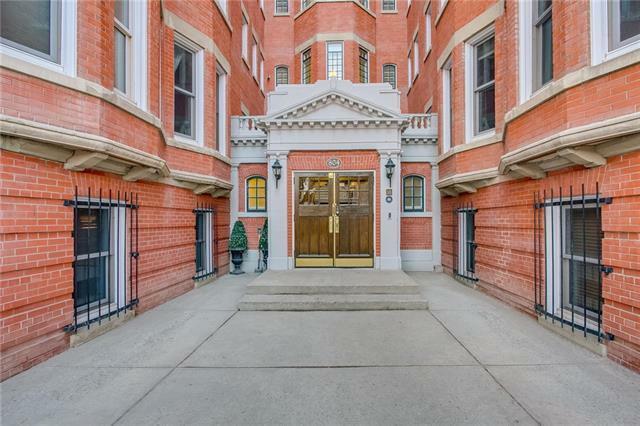 Own a piece of Calgary's history for under $300k!! The heritage designated Anderson Estates is one of Calgary's most architecturally unique buildings & is enriched with an abundance of old world character & charm. Soaring 10' ceiling & 6' windows in this bright, sunny, one bedroom unit with original dark stained oak woodwork throughout. This unit is NOT MAIN FLOOR!! Exquisite detail on the radiators, claw foot tub & built-in hutch are a few of the classic elements still intact. Located in the heart of Lower Mount Royal on a beautifully tree-lined street, with a 98% walk score! Call for your own Private Tour of the building and see this beautiful unit! !